Prayagraj: Hundreds of hoardings carrying the images of Prime Minister Narendra Modi and Uttar Pradesh Chief Minister Yogi Adityanath dotted the streets of the holy town as millions from across India and abroad have descended here for the religious, spiritual and cultural congregation taking place barely three months ahead of the 2019 general elections. The Kumbh Mela, which opened formally in the early hours of Tuesday with the first of the six 'shahi Snan' (royal bath), and is expected to draw over 15 crore pilgrims this year, is a sea of saffron and slogans such as "Modi tum sangharsh karo, hum tumhare saath hain" (Modi you lead the fight, we are with you) and "Mandir wahin banayenge" (temple will be built at the disputed site in Ayodhya) rent the air at the site. Notably, both Modi and Yogi have waxed eloquent on the preparations for the holy dip, which according to legend, opens the doors to heaven. The Kumbh Mela administration officials told IANS that Yogi has resolved to provide an unforgettable pilgrimage experience to crores of devotees visiting Kumbh. They say that Yogi has laid special emphasis on "blending the grand traditions of Kumbh with the deployment of modern techniques and solutions" so that the kalpavasis, spiritual gurus, dignitaries, foreign visitors and the pilgrims have a "life emancipating experience" during their visit to Prayagraj. At a press conference on Monday, Prayagraj Commissioner Ashish Kumar Goyal told reporters that the state government is fully dedicated to providing a unique and fulfilling experience to visitors, highlighting that "there is no shortage of budget, we have sufficient funds". He maintained that the Chief Minister is personally monitoring the Kumbh Mela, and has advised officials to do everything that is needed.The Kumbh is also the world's largest religious congregation of its kind, making it a potential political playfield for the BJP that has a strong voter-base among the Hindus. The 2019 Kumbh Mela is organised on a much wider scale than its previous editions and multiple tent cities, along with lakhs of new toilets have cropped up along the banks of the holy river Ganga. The historic city was also recently renamed from Allahabad by the BJP government.Displayed here are multiple life-size hoardings welcoming pilgrims to Kumbh and they carry images of Modi and Yogi on either side with their messages. Such hoardings and posters are among the first sights that visitors arriving in the city encounter, and on the way leading up to the Sangam -- the confluence of Ganga and Yamuna rivers and the mystical Saraswati -- visitors are introduced to the various programmes and campaigns introduced and promoted by the BJP government. One example of this is a massive yellow-coloured hoarding that appears near the Parade Ground on Kali Road, about 3 kms before the Sangam, that sings praises of the bonhomie between the Yogi-led Up government and the Modi-led NDA government at the centre. It states that in keeping with the piousness of the Ganga, the state of Uttar Pradesh is marching forward. The hoarding, whose similar variations also appear in other parts of the city, states that Modi has allotted Rs 146.87 crores and Rs 52.76 crores towards Prayagraj District Sewerage Project and Prayagraj District Sewerage Network Project, respectively. The hoarding carries smiling pictures of Modi and Yogi on either sides, with the achievements of the BJP government inscribed at the bottom. Another similar hoarding reads: "Ek dubki aastha ki, ek bhaav sadbhav ka" and displays a saint offering water to the Sun god. The smiling pictures of Modi and Yogi on either sides of the hoarding keep the visitors company here as well.The Kumbh administration has built pontoon bridges that lead the visitors to the five-kilometre bathing ghat at Sangam. These bridges can only be reached after passing through the by-lanes of the city, which are dotted with hundreds of such hoardings and posters at regular intervals. While several such hoardings in multiple colours and sizes attract the visitors visually, there are occasional political sloganeering in the praise of the two leaders that reverberate the Kumbh nagri. Organised processions of men, women and sadhus were seen late on Monday evening, hailing lord Ram and calling for the construction of a grand Ram Temple at the disputed Babri Masjid site. Such slogans, almost routinely, shift from singing the praises of gods to those of PM Modi. Visitors too seem to have entered the election mood as political conversations and predictions can be heard at roadside tea stalls and dhabas. This gathering of Hindu pilgrims also becomes significant for its political implications as Congress President Rahul Gandhi had recently set on a Mandir-hopping exercise before the state assembly elections. 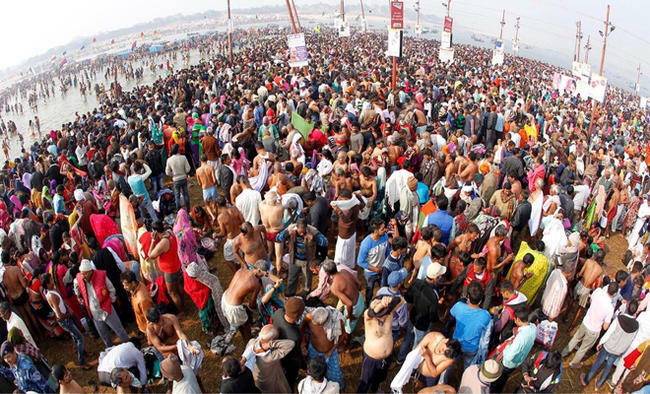 The Kumbh Mela, 2019 is being held from January 15 to March 4, with six important bathing dates. Makar Sankranti, which falls on Tuesday, was the first of these dates for bathing, and officials expect over a crore devotees to take the holy dip on the first day of the fair.